Editions : The book has been reprinted, with identical content but a different cover. To truly get The Original Series Technical Manual you should think about the context. The book came out at a time when Trek television was dead and gone; the only written material being produced was fan-created - and this at a time when there were no DVD sets, nor even home video. Franz Joseph set out to create a book that would describe and flesh out the fictional world Gene Roddenberry had created, and in that he succeeded superbly. 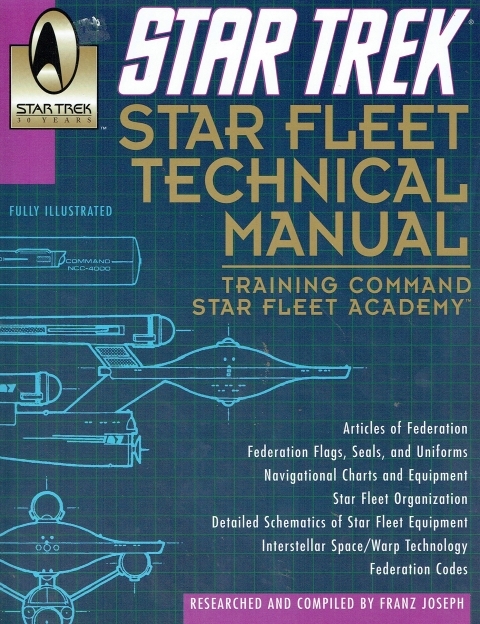 The TOS TM is rather more wide-ranging that its TNG successor; note that this is the Starfleet manual, not the Enterprise one; in fact it barely touches on the Enterprise, giving us a few diagrams and some very basic specs along with a list of ships of the same class. But Joseph wasn't afraid to speculate; he created several new ship designs from a heavy combat ship through destroyers and scouts and even a tug; he gives us a copy of the Federation Constitution, uniform designs, details of what the different warp factors mean, a map of the galaxy... lots of fun facts. In some ways the book is a Jack of all trades, master of none; it covers many topics, but we get very little information on any of them - indeed for much of the book there is little beyond large diagrams with labels on them rather than the pages of text in the TNG TM. On the upside, the manual contains that much less to be contradicted. Contradictions have indeed crept in, though, and this is something of a controversial topic. Roddenberry co-operated with Joseph on the book, no doubt knowing that it would help promote the popularity of Trek and contribute to any continuation. However, when the Motion Picture arrived rumour has it that Gene decided that he didn't want Joseph getting the credit - or the royalties - for the use of the material he had created to "fill in the gaps" in the Trek universe. It's said that Gene specifically went out of his way to contradict the Tech Manual in as many ways as possible. For instance he issued a set of starship design rules which render every single one of Joseph's ship designs unworkable. He replaced Joseph's orbiting Starfleet headquarters with a surface base. He came up with a different version of the Federation seal seen in the book. Whatever the rights and wrongs, the TOS TM remains a fascinating book and is well worth reading. is one of my favourite books.